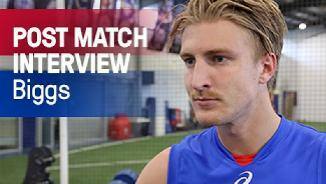 westernbulldogs.com.au reviews Shane Biggs' 2017 season. AFL Media dissects who is in line for possible selection this week. Who put their hand up for selection over the weekend? 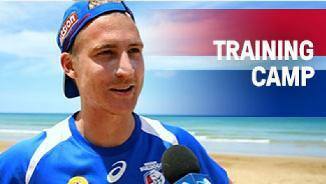 Biggs: "Couldn't get that real consistency going"
Shane Biggs became a Bulldog during the 2014 NAB AFL Trade Period, arriving from the Sydney Swans along with pick No. 39 in return for pick No. 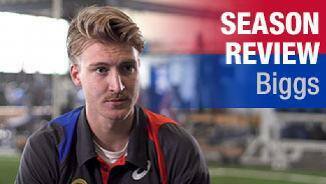 37 in the 2014 NAB AFL Draft. Biggs, a rebounding defender, played six games in three seasons at the Swans. Taking the road less travelled to the big league, Biggs didn’t play TAC Cup football, rather started his push for the senior ranks from the Eastern Football League, before making his first senior appearance in the VFL for the Bendigo Bombers in 2011. In 2012, Biggs was rookie drafted by the Swans, making his debut in round 23 of the following year against Hawthorn collecting 18 disposals. The 187cm back played a further two games that season, finals against Carlton and Fremantle, gathering 21 and 15 touches in respective matches. While glandular fever delayed his start to 2014, impressive NEAFL form earned him a further three senior appearances in a Swans outfit that would ultimately play-off in the Grand Final. Smart with ball in hand, with strong work ethic, Biggs has played both off half-back and through the midfield in his time in the harbour city. Biggs managed three games in 2014, highlighted by a 24-disposal performance in round 21 against St Kilda. The half-back was one of four Bulldogs to play every game in season 2016, culminating in being a member of the AFL Premiership side. By his own admission the 26-year-old had an inconsistent start to the 2017 season before finding some of his best football in the second half of the year. Biggs collected 27 disposals against Gold Coast in Round 18 and 29 against the Bombers in Round 19, also picking up 11 marks and gaining 555 metres off of half back. He followed up with a 24 touch, five mark and four tackle performance against Brisbane the following week, firmly restabilising his place as a key member of the Bulldogs back six. Notched up his 50th game for the Club in Round 21. Had a career-high seven rebound 50s against the Bombers in Round 19. “A bit of inconsistency early kept me out of the team for a couple of weeks but to play 16 games, the majority of them the second half of the year, was promising. “I knew when we were down a few backman I had to play a bit taller – so at times I played on some taller players as well as smalls. That’s something I worked on and got it going towards the end of the year a bit better. Shane Biggs picked up right where he left off last season in 2016, going on to be one of four Bulldogs to play all 26 game this season after playing the final eight in 2015. 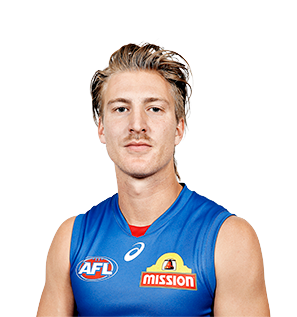 Reliable, hardworking backman who according to Champion Data played in defence 94% of the time but picked up almost 70% of his possessions in the middle of the ground as a key member of the Dogs’ rebound machine. Finished second at the Club in metres gained with 9,806. His smother on the mark in the final quarter of the Grand Final followed by second, third and fourth efforts that led to a Liam Picken goal was a purists highlight. Recorded career highs in average disposals, contested possessions, metres gained, marks and intercept possessions. “I try not to set too many goals, just go day by day but to just play consistent and stay in the team was something. Joining the Club at the start of 2015, Biggs struggled to find consistency and a clean bill of health in the first half of the season. After playing senior football in rounds eight and nine, he was sent back to the VFL to work on adjusting to ‘Bulldogs football’. The challenge was set by the coaching staff, and it paid off. Biggs returned in round 17 to play a crucial role in defence in the back end of the season. He didn’t miss another match for the rest of the year and his consistent efforts became a feature. Biggs was one of only a handful of Bulldogs with finals experience entering the elimination final, with the former Swan picking up 17 disposals and five tackles. Biggs averaged 21 disposals in his final eight matches, from round 17 through to the elimination final.